Your true character is more important than other’s perceptions, as it is the strength of your foundation. Like a suspension bridge, our outer appearance is what others see, and it depends on the perspective. Driving across the bridge, you do not see the posts into the ground, you only see before you and above you. Looking at the bridge from afar, you see the posts moving into the ground, yet you are not necessarily aware of how deep the foundation is rooted. It is the same with us. Others see our outward appearance, both what we choose to show the world, and what they choose to see. What others choose to see is based on their experiences, opinions and beliefs, which may not be in line with who we truly are at our core. If we choose to accept other people’s opinions and beliefs about us it can weaken our foundation. They may not be fully in tune with their own spirituality and inner souls, and without us showing our true character, it is more difficult for them to understand others. To strengthen our foundation, our inner core, we must root down deep into our being, just like the posts of the suspension bridge, to both understand and support our beliefs & opinions, thus allowing our foundation to rise up to greater heights. Rising up with our true nature allows our outer appearance to be supported by our true character. 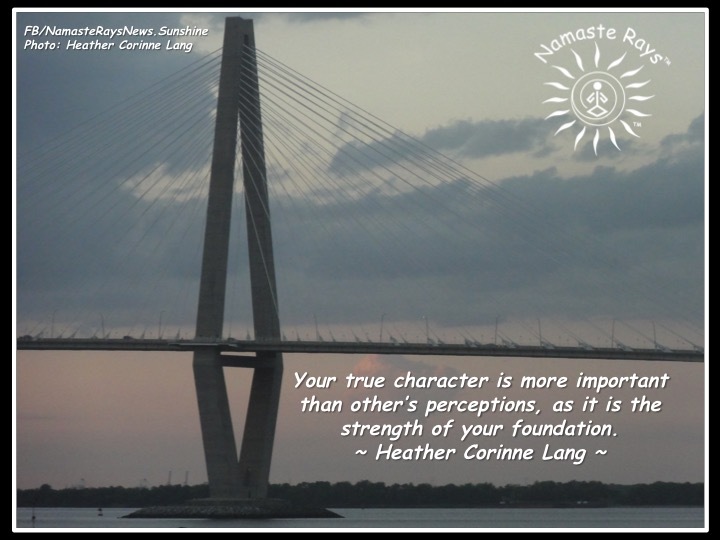 Our foundation is now the strength of our entire structure because we are living our true nature, our true character. May you use your inner foundation to strengthen your perception of yourself as well as those around you. For an appointment or more information on my services, please message me. De-LIGHT-ed to Shine on your blogsite! Thank you!